Before the drip came the flame. Jackson Pollock (1912-1956) stakes his claim to being one of the greatest American painters of the 20th century mainly on the basis of the king-size canvases he covered with drips and splatters. That breakthrough — radical even by the standards of abstract expressionism — occurred in the late 1940s. This is the Pollock of the late 1930s who is working in midsize mode and smaller, often painting recognizably human forms. The most unexpected piece in the show may be an enamel bowl — Jackson Pollock was a potter? Who knew? — on which he painted, characteristically, figures engulfed in the flames of hell. 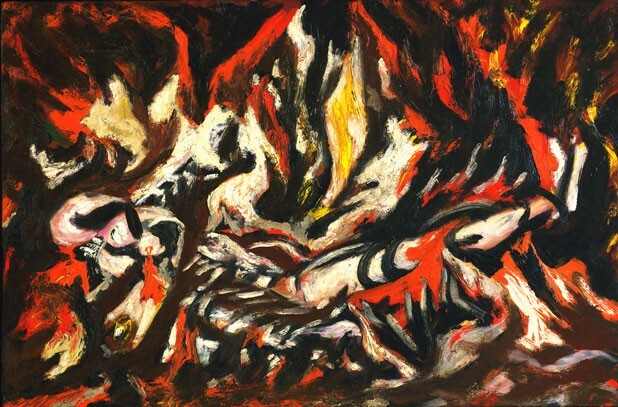 As the show’s title indicates, fire is a recurrent reference — in the artists’ palettes as well as in their imagery. It’s an ingenious pairing, albeit not the first of its kind. A Manhattan gallery organized a similar show in 1998, connecting the pre-drip Pollock to Orozco, who was 29 years his senior, and to another of the titans of Mexican mural painting, David Alfaro Siqueiros. The Hood, however, has the unique advantage of being situated just across the Dartmouth Green from Orozco’s mural masterpiece “The Epic of American Civilization.” Visitors to “Men of Fire” would do well to go first to the Baker -Berry Library where, in an otherwise nondescript basement corridor, they will be stunned by Orozco’s fresco cycle, still aflame with color 80 years after he began painting it. The mural’s effects on Pollock are evident in the groupings of works in the Hood, which include rarely seen preparatory studies for Orozco’s mural. The link is most obvious in the pieces by the two artists that “Men of Fire” curator Sarah Powers has revealingly hung side by side. “Untitled (Figure Composition),” a Pollock on loan from New York’s Metropolitan Museum of Art, is clearly modeled on a panel in the Orozco mural “The Departure of Quetzalcoatl.” A gouache-on-paper study for a detail of that wall-size work is on view right beside Pollock’s piece, which was executed in the same medium. It shows a striding figure making a sweeping gesture with his arm, much in the manner of Orozco’s great white god. “Bald Woman with Skeleton,” a Pollock oil owned by the Hood, likewise shares compositional elements with a section of the multipaneled Orozco mural known as “Dead Knowledge.” Pollock presents a central, androgynous figure bowing over a spine and rib cage that’s encircled by staring skulls. It’s a macabre image, but not nearly as shocking as Orozco’s depiction of a ghoul extracting a malformed fetus from between the splayed legs of a prone and writhing skeleton. A chorus line of zombies in academic regalia are looking on with haughty expressions of approval. In a podcast lecture available for free at the Baker-Berry reserve desk, a guide explains that Orozco is excoriating academia for imparting “dead knowledge” rather than information that could be put to practical use. The artist appears to be suggesting that students should be schooled in the means of killing off “The Gods of the Modern World,” which is the official title of this segment of Orozco’s anti-industrial and anticapitalist mural. Not surprisingly, some Dartmouth donors and profs reacted angrily to Orozco’s savaging of institutions such as the one that had commissioned this mural. Pollock has no such political intentions in “Bald Woman” — or in almost any other of his works. His socially unengaged art differs in its essence from that of Orozco, who often retooled mythical themes in order to comment on Mexican or Pan-American history. Orozco was also a far more representational artist, even in comparison to the young Pollock, who had studied under the American scene painter Thomas Hart Benton. A couple of paintings included in “Men of Fire” hint at having been inspired by Orozco but actually stand out as powerful examples of Pollock’s originality. “Naked Man With a Knife” (lent by London’s Tate Modern) does allude to Orozco’s leitmotif of ritual sacrifice in “The Epic of American Civilization.” But this entanglement of human limbs filling almost every square inch of a 4.5-by-3-foot canvas is not the least bit derivative. Pollock never comes across in “Men of Fire” as a student in thrall to the work of a much-admired master. Six years later, in 1936, he made a momentous trip from New York to Hanover, N.H., expressly in order to see “The Epic of American Civilization.” As the Hood show implies, the Dartmouth mural put Pollock on the path to becoming an aesthetic and existential hero. But he didn’t set off immediately in that direction. Pollock first encountered a detour in the form of the alcoholism and the psychological demons that stalked him until his death at age 44. It wasn’t until his convalescence in 1938, following a four-month stay in a psychiatric hospital, that Pollock began painting the pictures that reveal Orozco’s influence. The commonality in colors, compositions and themes is laid out for all to see at the Hood. But the imprint Orozco made on Pollock’s consciousness goes deeper. The Mexican artist was fearless in expressing his tragic vision of the world. As the audio guide to the Baker-Berry Library mural notes, Orozco does not depict American civilization as progressing ever steadily toward abundance and freedom. Taking an approach opposite to the optimism of many New Deal muralists, Orozco shows history as moving cyclically, not forward. His Dartmouth epic ends as it began — with a scene of ritual human sacrifice. Pollock shared that desolate view, though not as explicitly as Orozco. The two artists were also of one mind in their belief in the redemptive potential of an individual — a man of fire — who resists surrendering to the encroaching darkness. The Hood show is thus as much about a philosophy of life as it is about the legacy of one great painter and the trajectory of another.